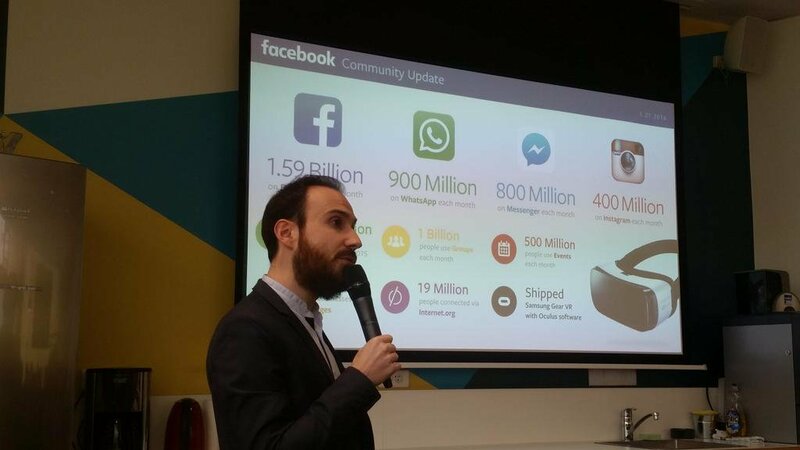 On Tuesday, February 23, the Partech Shaker invited Grégoire Gimaret, Retail Lead at Facebook, to present the social marketing possibilities offered by the social network to professionals. This Mind Shaking Lunch gave the 50 people gathered an opportunity to learn more about Facebook’s potential, from data collection to consumer targeting, at a time when mobile devices reign. This summer, Apple is expected to sell its billionth mobile phone. In 2020, 70% of the planet’s population will have a smartphone. While our first forays into the internet took place on the family computer, nowadays connected devices – primarily smartphones – tend to be the gateway for new users. Facebook, which many users discovered on their home computer, arrived just before the shift to mobile. Now 80% of users discover it this way. No fewer than 1.6 billion people worldwide have a Facebook account – that’s one person in four – including 30 million people in France, and 25 million on mobile. Grégoire Gimaret shared the average age of French Facebook users: 38 years old. This is nearly the average age in the country but it can be seen as quite old compared to other social media. Facebook reaches users all around the world and takes up 1 in every 5 minutes spent on mobile phones. With the Facebook login, available on the most common mobile and desktop app platforms, a person is known by the same user ID everywhere. This is the biggest advantage of Facebook over competitors: the ability to actively target individuals who might be interested in a company’s products instead of hoping that they passively show up in search. Facebook helps users discover new products instead of searching for them and in this way it is more adapted to mobile experience. Each new Facebook feature increases its value as a hub, allowing experimentation and implementation of new advertising strategies for businesses – 50 million of which also have an account. Facebook is therefore the ideal platform for marketing professionals. It is both a huge source of data and an equally huge source of potential consumers. It’s at the crossroads of two major determining trends for 2020 and 2030: the proliferation of connected devices and Big Data. There is growing awareness about the efficiency of advertising campaigns. The era of spam ads taking over our screens is undoubtedly over. The studies have shown that their impact has plummeted – the click rate on these intrusive ads is now close to zero. This decline can be explained by apathy but also, maybe above all, by the arrival of mobile. Cookies are increasingly ineffective in a world where 70% of humanity is on mobile. One out of every two euros invested in the web is for nothing. So, new responses are needed: responses which rely on content and adaptation to the target – advertising content which is personalized, or nearly. This emerging technique is necessary to adapt to a connected world and ever more demanding users. Facebook, a participant in digital transformation, even lends itself to finding advertising solutions just by its format alone. It is possible to create profiles of users based on audience criteria such as location, age or interests. Over a thousand criteria can be used to define profiles according to the principle of lookalike marketing. Thus rather than being done blindly, advertising is targeted to maximize the impact of its message. Facebook targeting makes it possible to use highly personalized models. Grégoire Gimanet stressed the differences between Principal Audiences, Custom Audiences and Look-alike Audiences. He used the example of the car brand Lexus which used 1000 different ads that were made from the same unique template to address different targets having different interests. On top of knowing who you want to reach, you can also know who should not be pointlessly reached twice. To do this, Facebook invented the conversion pixel, which has to be included on any page you want to track conversions from. Then, you create an ad for each Custom Audience and associate it with its respective pixel. In short, the conversion pixel helps advertising the right message to the right target. Among the tools that Facebook offers to professionals, Grégoire Gimanet also presented Lead Ads, which help businesses conduct more effective email campaigns. With this tool, Showroomprivé obtained an installation rate of its app that was 15x higher than with classic mobile display campaigns. Video is a preferred medium. More than 8 billion videos are viewed every day on Facebook. Many innovations have been designed to increase a video message’s engagement rate, with the goal being to stop the user from scrolling past. Since the first 10 seconds are the crucial window, when 70% of clicks happen, there are many tricks for engaging the user within this frame. One such tip is a gentle audio configuration with sound that increases progressively, in contrast to the immediate loud volume of aggressive spam advertisements. Some tools, like Power Editor, allow a user to create 20 to 30 versions of video content to be best adapted to a range of audiences. With mobile dominating, the video message is designed for the smartphone format. Carousel Ads is another tool which makes it possible to display ten approximately images for the user to scroll through, instead of only one or two. Big content, pocket-sized. Instagram, an application with 400 million users which was acquired by Facebook in 2012, is a promising medium in terms of innovative targeted marketing. Above all, the collaboration between Facebook and Instagram makes it possible for user data to be cross-referenced between the two companies. Inventive content, which is even more personalized – and therefore more engaging – can then be delivered to these marketing user profiles. Moreover, Instagram is less expensive than Facebook in regard to the acquisition of applications (-15%). Grégoire Gimanet concluded his presentation by letting us in the know of soon-to-come features. He presented the local awareness adverts new characteristics. Soon local stores owners will be able to target people located within 50 meters of their shop and check, after the ad, if they entered the store. The presentation detailed how Facebook helps marketers make the most of every campaign and maximize their budget and growth potential.